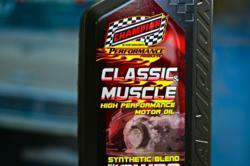 Champion Oil, a globally recognized leader in purpose-built lubricants, announced today that Champion’s high-zinc “Classic & Muscle” Motor Oil would be available this year exclusively at the RNB Restorations USA booth at the 13th Annual Syracuse Nationals Car Show on July 20th-22nd, 2012. The Syracuse Nationals Car Show has over 7,000 car registered every year and gets over 90,000 visitors. Five Canadian provinces and over 40 US states will be represented at the NY State Fairgrounds. More than 500 national and local vendors will be on hand for enthusiasts to purchase any part imaginable for their cars. Over 575 on-site campsites are sold out, months in advance. The Syracuse Nationals is the largest and most diverse classic car event on the East Coast! RNB Restorations USA, Inc. (RNB), headquartered in Niagra Falls, NY is a Master Warehouse Distributor for Champion Oil in both the United States and Canada. Primarily working with Champion’s Performance and Racing Division, RNB sells motor oils, lubricants, chemicals, and additives to Racing Distributors, Jobbers, and Installers, as well as, direct to racers, enthusiasts, collectors and performance oriented hobbyists. Contact Richard Matthie from RNB Restorations at 905-658-7509 or visit them at http://www.championbrandscanada.com/. Champion “Classic & Muscle” Motor Oil is purpose-built to meet the lubrication demands of hot rod, street rod, classic and muscle car engines, especially those using flat tappet and roller cams operating at high RPMs and requiring high-pressure valve springs. To meet these challenges, Champion utilizes its premium ZDDP anti-wear protection package, which contains a unique balance of chemistry that includes high levels of zinc and phosphorus. In addition, all Champion “Classic & Muscle” Motor Oils contain an exclusive TVS® (Thermal Viscosity Stabilizer) technology. This proprietary technology delivers unmatched film strength at high temperature, better piston ring seal for maximum compression, and increases horsepower and torque in most engines. About the company: Champion Brands, LLC, is a globally recognized industry leader in specialty lubricants for over 55 years. Champion also produces and blends over 350 products including fuel, oil, engine additives, and lubricants for the racing, automotive, heavy truck, agricultural, industrial, and specialty markets. For more information about Champion “Classic & Muscle” Motor Oils contact your nearest Champion distributor, or call Champion at 800-821-5693 or 660-885-8151. Champion Brands, LLC; 1001 Golden Drive, Clinton, MO, or go to http://www.championsusechampion.com.